Kozhikode, 1st September, 2016: Faizal E. Kottikollon, Founder-Chairman of KEF Holdings, and Faizal and Shabana Foundation, today was honored with the prestigious P.V. Sami Memorial Award 2016 for his valuable contribution in business and philanthropy. 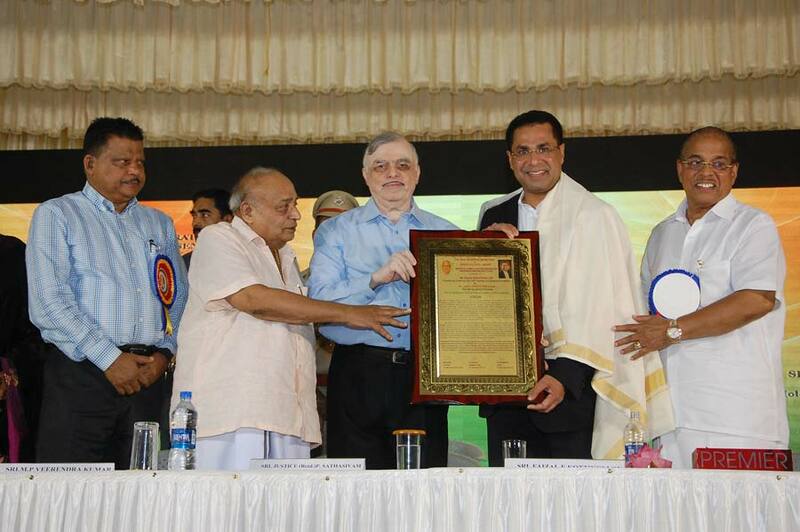 The award ceremony was held at Tagore Centenary Hall which was attended by eminent leaders like Governor of Kerala, Retd. Justice P. Sathasivam, M.P. Veerendra Kumar 〈MP〉, M.K. Raghavan 〈MP〉 and A. Pradeep Kumar 〈MLA〉, P.V Chandran 〈ME, Mathrubhumi〉, PV Gangadharan 〈Director, Mathrubhumi〉 among others. The award has been instituted in the memory of P.V. Sami, Founder of Kerala Transport Company and every year achievers are honored with this award for their contributions in diverse sectors. This year, Faizal E. Kottikollon was selected by an eminent jury panel comprising of M.P. Veerendrakumar 〈MP and Chairman and MD of Mathrubhumi〉, Prof. Dr. C.K. Ramachandran and well known Director Sathyan Anthikad for his visionary approach to modern infrastructure and relentless development of education and healthcare and in Kerala. On receiving the award, Faizal said: "My work is governed by the vision to help build a better world, through making a positive difference to society, particularly in the sphere of healthcare and education". He added "I feel honored to receive this prestigious award and it affirms my faith in our efforts, knowing that we have been able to positively impact different communities in some way. My wife [Shabana] and I will remain devoted to our mission of giving back to the society." With a vision to revolutionize the infrastructure development sector in India, Faizal has invested 650 crores into building a state-of-art Infra Park, KEF Infra One, in Krishnagiri, which is dedicated to offsite construction. Using modern technology from around the globe, KEF Infra 〈the infrastructure arm of KEF Holdings〉 is looking to change the construction sector in India into a component-based modular format, akin to the automotive business. With this innovative way of doing construction, KEF Infra is able to build projects 50% faster than the traditional construction methods, which can positively impact India’s growth when it comes to the essential sectors such as education and healthcare. Faizal also drives his organization and employees to seamlessly support the Faizal and Shabana Foundation, which he established in 2007 along with his wife, Shabana Faizal. The foundation has helped to develop the GVHSS Nadakkavu School in Kozhikode to modern standards, which has seen the school get ranked among the top 4 government schools in India within 2 years of its refurbishment and is now seen as a model project for school makeovers. In keeping with the ethos of giving back to the society, KEF Infra along with the Faizal & Shabana Foundation is also rebuilding the government school in Krishnagiri village with modern amenities. The school which is currently being built will be a dedication to Dr. APJ Abdul Kalam. The Foundation is also working at the grassroots with the 8 villages that surround KEF’s Krishnagiri facility. Apart from working on imparting lifeskills and vocational skills to the villagers, the Foundation is also working towards health and sanitation facilities in the villages. Moreover, KEF Infra One is also hiring local talent with a view to up-skill and educate people for job opportunities at the facility. KEF Infra has been an instrumental force in offsite construction and manufacturing. They aspire to be the differentiator in healthcare, education, and affordable housing. The parent company, KEF Holdings, works in diverse fields like infrastructure, healthcare, education, metals and investments with a vision to bring positive change in these domains. Faizal E. Kottikolon has also been named the "Visionary of the Year" for 2015 by Arabian Business and "Innovation CEO of the Year" 2015 by BNC Publications. Also, he has been featured in the Forbes Middle East list of top 100 Indian leaders in the UAE. In addition to this, Forbes ranked KEF Holdings among the top 100 companies that make an impact in the Arab world. Recently, KEF Holdings was one of 6 finalists for the Unilever Global Development Award administered by Prince Charles’ Responsible Business Network.